The arts, the beats, and the eats is what makes this weekend long event one of my favorite end of summer traditions. 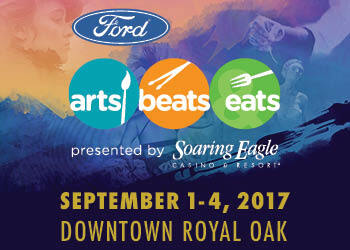 Ever since Royal Oak started hosting Arts, Beats, & Eats I've made sure I didn't miss it! A few years ago I had a studio loft located at the center of Arts, Beats, & Eats. As you can imagine, it was a FUN and action packed weekend! I even recall a huge storm that literally wiped out the entire event for a few hours! The following year I volunteered to work a beer tent for the Royal Oak Jaycees and rode my bike to and from the event. These past few years have looked a little different as we are now in tow with two little kids. We park at the Royal Oak High school and take the free shuttle over to the event. With so many great memories, It's no wonder why I am thrilled to be giving away two admissions passes and $40 in ticket vouchers for food and drink to one lucky winner! Enter below. Michigan has some talented artist and what better way to admire their work than the festival. You will find local photography,pottery, and, paintings. I am always amazed at how creative these artist are. Restaurants from all around Detroit show off their signature dishes as you will find everything from burgers and hot dogs for the kids to gourmet lobster bisque soup. Sip it all down with a refreshing Michigan brew. Entertainment is never disappointing at Arts, Beats, and Eats. You will find many different stages with different genre's of music. Anywhere from alternative to jazz. They even have a kids stage with some really cool stuff! Some of the major artist you will find performing this year are Candlebox, B52's, and 311. Check out the complete line up here. Simply comment on this blog post. Tell me anything you love about Arts, Beats, & Eats or why you want to go. One winner will receive two admission tickets and $40 in ticket vouchers. The winner will be chosen randomly. Good Luck! Ends August 28th at 9 PM. Below is a glimpse of Saturday nights line up. It's sure to be a blast! 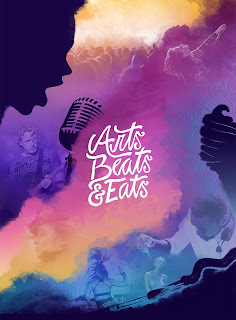 I would love to go to Arts Beats and Eats, its been a long time since me and my hubby been to that event and this time I would love to go with our kids. It would be a fun and exciting experience for them. I agree. Check out the events for kids. They have some cool stuff. I have never attended the festival! What a lovely date it would be! It is so fun! I love taste testing all the yummy food. I have only been once and it was cut short due to storms. I would love to have the full experience of the food, music, arts, and the people. It's definitely a good time. Fingers crossed there is great weather this year. I haven't been in a few years, but I would LOVE to go again for the amazing food!! I always leave stuffed from tasting such amazing food! Congratulations to Amy! You are the winner. Have fun! It's my birthday weekend. Would love to have a great birthday my last year in my twenties! I'd love to win this! We love checking out the art and grabbing great food! Great art and food! Plus you can enjoy all of what Royal Oak has to offer. So much to do. I wanna eat all the food I can eat! Love listening to all the great music and trying some of the food. It's a great way to end summer. As much as I am sad to see summer end, I am looking forward to this festival. I love all of the food! We ate so many amazing things last time we went!! Such a good experience for kids too. So much to see. Plus there is a carnival for those interested. The food! I'm getting hungry just thinking about it! Was the storm year the year Bret Michaels performed? Ryan and I waited it out in 5th Avenue, LOL. Such a fun event! Yes!!! and when we got home a tree had crushed our friends car. It was a crazy storm. Tornadoes had struck in Ferndale and Pleasant Ridge. Good for you guys for finding shelter and waiting it out. Great place to check out new/upcoming bands, enjoy great food, and people watch! Yes, I remember a few years ago there were some bands I've never heard of and now they are well known! We love going and have gone every year since moving here! Our daughter enjoys going and we are excited to take our second daughter this year as well! Love it! You're making memories.